I once had the enormous pleasure of meeting the director John Carpenter at the National Film Theatre, where he’d presented a lecture on his idol, Howard Hawks. I pointed out that he’d paid homage to Hawks’ westerns (Assault on Precinct 13) and science fiction (The Thing), but never tried his hand at a ‘screwball’ comedy. He joked that he might do just that, but with only two movie credits this century (2001’s lacklustre Ghosts of Mars and 2010’s barely-released The Ward), it’s unlikely we’ll ever see him in Bringing Up Baby mode. In any case, Mr Carpenter is now pursuing a different path, albeit one which feeds on his parallel career as a soundtrack composer: rock star. Which is why Saturday evening found me at the Victoria Warehouse, a short distance from Manchester United FC’s home ground. The European leg of his Release the Bats tour had originally included two nights at Manchester’s Albert Hall, but a switch in promoters precipitated a conflation of both events into one venue, a massive concrete box with all the ambience of a multi-storey car park (and comparable acoustics, according to some who ended up standing at the back). A makeshift sign near the entrance alluded to Escape From New York, but the building itself was a far more convincing nod to that movie. Doors opened at 6:30pm, and most of the 4,000 ticket-holders seemed to have made their way inside by 7pm, but other than a couple of technicians, the stage remained empty until 8:30pm. Luckily, I’d managed to finesse my way into the balcony area, which offered very limited seating, but the vast majority who’d expected to watch the concert in relative comfort were instead forced to stand for three hours with a restricted — or non-existent — view of the 75-minute set. The sole saving grace was the performance by Mr Carpenter and his band, which was excellent, although the balcony may have been the only place where it could be properly enjoyed. In amongst the instantly recognisable Halloween, The Fog, Big Trouble in Little China et al, we were treated to tracks from his two volumes of Lost Themes, belted out in a mesh of synthesiser and heavy guitar. Please note that whilst I welcome comments, you accept full responsibility for the accuracy of any statements made. All views are your own. 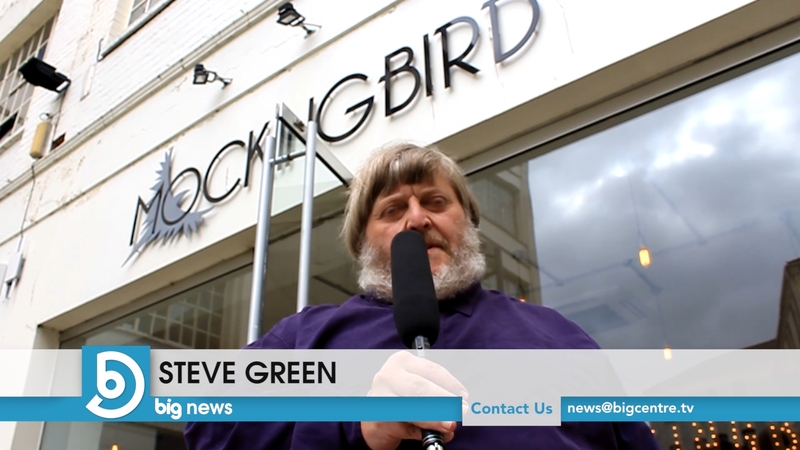 My latest news report for Big Centre TV makes its debut during tomorrow morning’s edition of Good Morning, with repeats during the day. It’s an extract from a longer interview with FrightFest’s Alan Jones, due for a print appearance in The Dark Side. As usual, it’s Chrissie Harper behind the camera. The channel’s in flux right now, as it becomes part of the Made TV network, but I was very pleased to take a ‘phone call on Friday from one of the programme hosts, expressing his wish that we become a permanent part of the line-up. 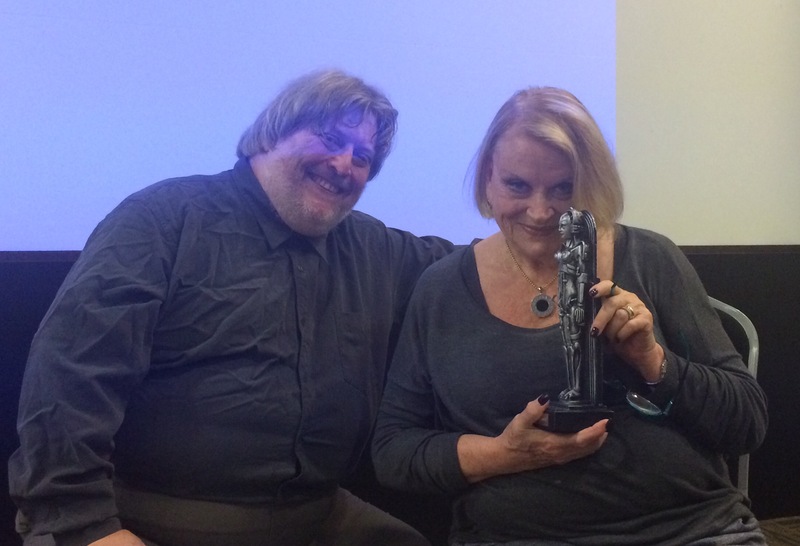 I had the immense pleasure yesterday of interviewing German actress Dagmar Lassander (The Frightened Woman, Forbidden Photos of a Lady Above Suspicion, The Black Cat) on stage at the 27th Festival of Fantastic Films, as well as presenting her with the Society of Fantastic Films International Award, a rather lovely statuette modelled upon the robot Maria from Fritz Lang’s Metropolis. Our conversation is earmarked for publication in a future edition of The Dark Side, with the footage appearing later on Ghostwords TV (alongside other interviews filmed that afternoon by my colleague Chrissie Harper). In the meantime, Big Centre TV will be airing an extract of my recent chat with FrightFest’s Alan Jones tomorrow as part of its breakfast show Good Morning, with repeats during the day’s news programming. 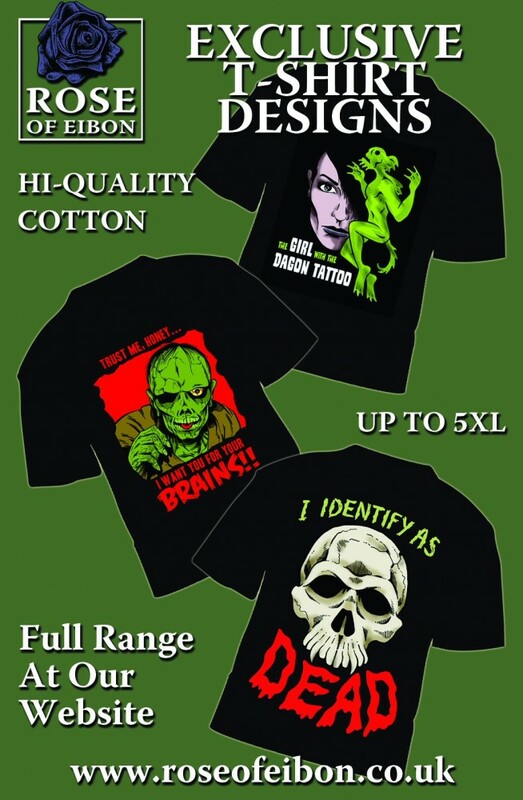 Among the various projects emanating from Rose of Eibon, the enterprise I run with my friend Chrissie Harper, is a line of exclusive t-shirt designs. The advert above is scheduled to appear in the next issue of The Dark Side, due out in a couple of weeks. As preparation for my on-stage conversation with Dagmar Lassander on Saturday, I’m currently ploughing through her back catalogue. Five movies under my belt so far: Hatchet For the Honeymoon (1970), The Iguana With the Tongue of Fire (1971), Werewolf Woman (1976), The Black Cat (1981), The House By the Cemetery (1981). Just Forbidden Photos of a Lady Above Suspicion (1970) left to watch. Irene Scob should also be nearby, so I’m planning to catch Eyes Without a Face just in case I can grab a few minutes with her as well. Midlands cable channel Big Centre TV is in the midst of dovetailing into the Made TV network right now — the formal switch-over happens on Tuesday — so it’s awfully gratifying they found time to plug my appearance on its breakfast show Good Morning this coming Monday, with repeats throughout the day. I’m featured interviewing FrightFest’s Alan Jones, in an extract from a much longer interview destined both for print (The Dark Side) and video (Ghostwords TV). Delighted to announce I’ve been invited to interview the actress and director Dagmar Lassander next Saturday for the 27th Festival of Fantastic Films in Manchester. I already had two reasons to be in the city that day: Chrissie and I will be interviewing attendees for a Ghostwords TV documentary on the event, plus we’re catching John Carpenter during his brief UK concert tour. The Dark Side has expressed interest in publishing my conversation with Ms Lassander, which is a bonus. 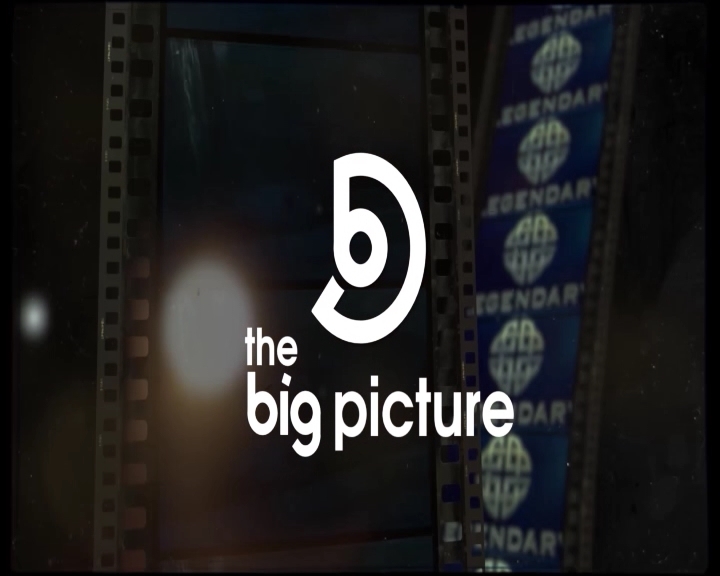 The first three news reports Chrissie and I produced for Big Centre TV’s The Big Picture are now available to view at our YouTube channel: (1) Mockingbird Theatre, (2) Flatpack Film Festival, (3) Blue Orange Theatre. 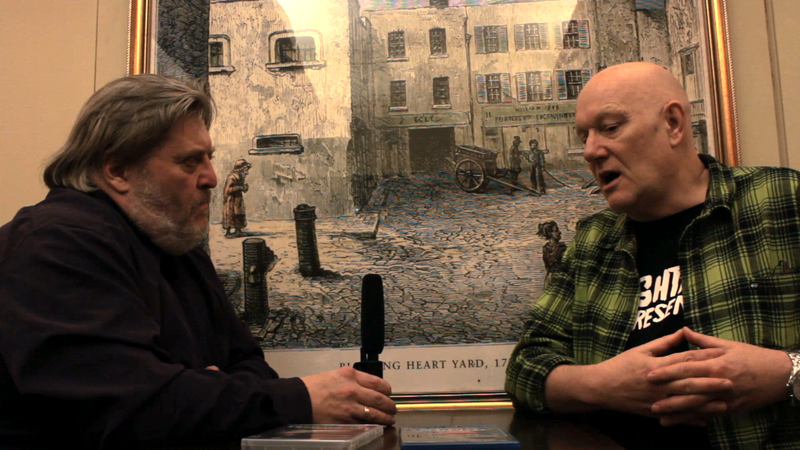 The fourth, an interview with FrightFest’s Alan Jones, will be uploaded shortly after it’s aired on Halloween. 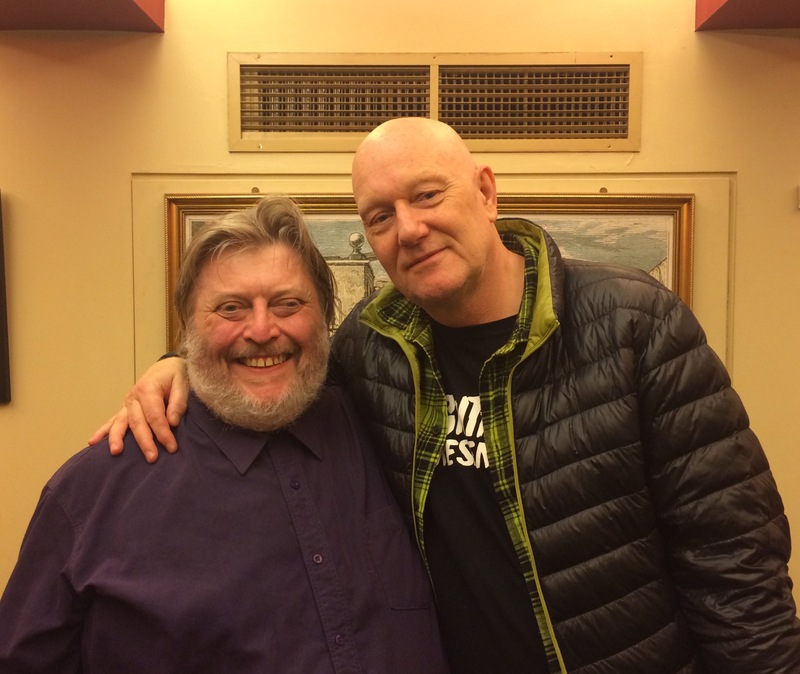 My Ghostwords TV colleague Chrissie Harper and I travelled down to central London on Wednesday, to interview FrightFest‘s Alan Jones. A three-minute extract is scheduled to play during Big Centre TV‘s Halloween programming, with the full edit earmarked for our YouTube channel soon as a text version has appeared in The Dark Side.